Belleview Heights Alzheimer's Special Care Center located in Aurora, CO, offers both memory care and respite care for seniors. With an outstanding staff and beautiful 66-bed community, Belleview Heights is thoroughly equipped to meet your loved ones physical, social, mental and emotional needs. Memory Care: Our exclusive Meaningful Moments® training enables our caring and highly trained staff to learn about our memory care residents' lives before it centers on their dementia needs. These preferences are then built into their daily lives to bring a sense of the familiar and create meaning in each day. Respite Care: For those seniors in need of rehabilitation after an injury or caregivers who need a break from the demands of caring for a loved one, the respite services of Belleview Heights Alzheimer's Special Care Center are beyond compare. 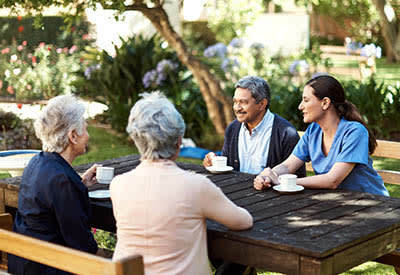 The staff at Belleview Heights Alzheimer's Special Care Center incorporates each individual resident’s life story into their personalized daily care plan. Utilizing our distinctive Meaningful Moments® approach, our team provides a warm and meaningful assisted living environment that includes family and friends. We welcome and encourage you to join us in the many activities we offer at Belleview Heights Alzheimer's Special Care Center.